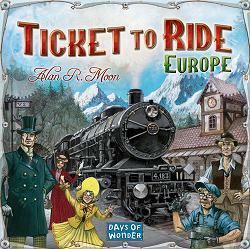 The second installment in our best-selling Ticket to Ride series of train adventures, Ticket to Ride Europe takes you into the heart of Europe. In addition to the new board map, Ticket to Ride Europe offers you brand new game play elements including Tunnels, Ferries and Train Stations. We`ve also upgraded you to First-Class accommodations with larger cards, new Train Station game pieces, and a lavishly illustrated game board.